I'm confused. Is this different to the Noumea released in Sept 2014? Nope. Guess he only just noticed it now. NZFE Fernside Fields Airfield, Canterbury, New Zealand. PLCH Cassidy International Airport, Christmas Island (Republic of Kiribati). NWWW Tontouta (Noumea) International Airport, New Caledonia. NZBA Balclutha Airfield, New Zealand. NZGS Gisborne Regional Airport, New Zealand. 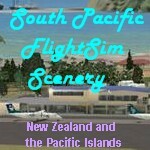 NCMK Mauke Airport, Cook Islands. NFNB Bureta (Levuka) Airport, Ovalau Island, Fiji. NCAT Atiu (Enua) Airport, Cook Islands. NCMG Mangaia (Auau) Airport, Cook Islands. NZYP Waipukurau Aerodrome, Central Hawkes Bay, New Zealand. NZES Wharepapa South Airfield, New Zealand. NZNE North Shore Aerodrome, New Zealand. NWWK Koumac Airport, Province Nord, New Caledonia. NVVV Bauerfield International Airport, Port Vila, Vanuatu. NCMR Mitiaro Airstrip, Cook Islands. NZTG Tauranga Regional Airport, New Zealand.